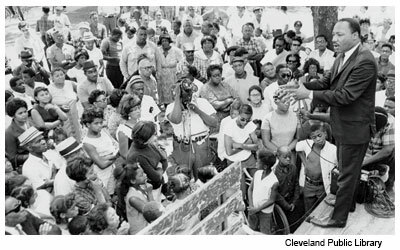 In Cleveland, activist movements to address social and economic disparities began with the African Americans who moved north from southern states in the Great Migration, lived in segregated neighborhoods, often excluded from the larger community, and who were deprived of economic and social opportunities. In response to this challenging environment, new activist organizations were formed to support community and individual advancement. In 1935 the Future Outlook League became the first organization in Cleveland to successfully use the boycott as a response to racial injustices. In 1963, the United Freedom Movement (UFM) was established as a coalition of more than 50 civic, fraternal, social and civil rights organizations. UFM protests targeted employment discrimination and were subsequently followed by a school boycott that lead to the desegregation of Cleveland public schools. The methods applied in Cleveland served as models of peaceful protest and mirrored those approaches being tried on a national scale, especially in southern cities of the United States. The ultimate objective of the movement, characterized by civil resistance campaigns, acts of nonviolent protests and civil disobedience, was to end discrimination against African Americans and secure the rights assured in the U.S. constitution and federal law. Serving as a foundation for productive dialogue and understanding, the civil rights movement resulted in historic achievements including the Civil Rights Act of 1964, the Voting Rights Act of 1965 and the Fair Housing Act of 1968. Despite these efforts, African Americans in Cleveland and across the nation continued to believe that social justice was elusive and that their futures were bleak. Civil unrest replaced former commitments to nonviolent protests. Outbreaks occurred in the Watts District of Los Angeles, Harlem in New York City and the Hough neighborhood in Cleveland. The infamous Hough Riots occurred in 1966, where 2,200 National Guard troops were dispatched to reestablish order. During the unrest homes and businesses were destroyed and four African Americans died. At the same time, the economic condition of many of Cleveland’s African American residents worsened in part due to the movement of white residents and businesses to the suburbs. This pattern occurred in cities all around the country. Rapidly growing intolerance for social inequality, along with an increase in organized groups seeking to end racial discrimination, resulted in a major shift in the political environment that made possible the election of Carl B. Stokes as the first black mayor of a major American city. As Cleveland’s 51st mayor, the Honorable Carl B. Stokes changed the course of the city’s history. His achievement not only set a standard for elections in major metropolitan communities but also established an agenda to meet the needs of Cleveland residents regardless of their racial and ethnic background. He was mayor for all of Cleveland, and during his two terms in office from 1967-1971, he accomplished much that serves the city steadfastly even today. He won voter approval for schools, housing and numerous other city projects. He also created "Cleveland Now!" – a public/private partnership that provided resources for a wide array of community needs. Equally important, Mayor Stokes demonstrated that in addition to civil rights activism, the cause of economic and social justice could be advanced by understanding the political process, by developing the knowledge and skills to organize and rally the voting base and by implementing a strategically focused and effective political campaign. 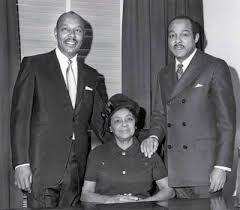 While Carl Stokes was pursuing his political career, his brother Louis was also making a profound impact on the civil rights movement as a gifted lawyer. He defended civil rights activists and led the successful challenge in the U.S. Supreme Court of a proposed redistricting of Ohio’s 21st Congressional District, a change that would have muted the voice of Cleveland’s African-American community. Following that victory, he was impressed upon to leave his legal office for the campaign trail, winning the 21st District seat in 1968 as Ohio’s first African-American representative. His 15 terms over 30 years in the U.S. House of Representatives including founding the Congressional Black Caucus, chairing the House Intelligence Committee, serving as the senior member of the Appropriations Committee and chairing special investigations into the assassinations of John F. Kennedy and Martin Luther King, Jr.
During the half century since Carl Stokes’ election, the influence of the Stokes brothers continued to resonate in Cleveland and serve as a foundation for many efforts currently underway. In the educational arena, the Cleveland Plan outlines the principles and measures leading to school reform and improvements. The Transformation Alliance is the quality assurance arm of the plan governed by a board of directors led by Mayor Frank G. Jackson and comprised of leaders from throughout Greater Cleveland. The Higher Education Compact involves colleges and universities in improvements by insisting they provide support systems that promote the success of students enrolling at their institutions from the public schools. Cleveland has witnessed a resurgence of affordable housing, accompanied by some neighborhood revitalization. A more attractive and inviting downtown corridor has materialized over the past 50 years, including Gateway, the lakefront, the Euclid Avenue corridor, the Opportunity Corridor and the completed Public Square overhaul. The Cleveland Clinic, University Hospitals and MetroHealth are making concerted efforts to minimize health disparities in concert with Care Alliance, an example of an organization that offers free or affordable health intervention. Mayor Stokes’ dream of a community-oriented police division may be realized with the Department of Justice Consent Agreement that requires the implementation of measures to promote transparency and community engagement through such measures as a Community Police Commission. There are many other improvements that could be added to this list to demonstrate that the city has made progress since the election of Mayor Stokes. In the same vein, we can identify additional challenges in housing, education, health care, public safety and the economy that will require our continued attention. Even as Cleveland has prospered during downtown redevelopment and community revitalization, the city has nonetheless been slow to recover from recurring economic downturns when compared to benchmark cities. Hardest hit during these times of financial challenge are less advantaged neighborhoods in all parts of the city. Thus, during times of great opportunity, including the present, we must extend to all the benefits that too often have accrued only to the few. This effort must begin with bringing organizations and people of Cleveland together to commemorate the past and develop actionable plans with outcomes that lead to a more inclusive city and that continue to respond to myriad ongoing challenges. Improved educational attainment, affordable and viable housing, better health care delivery, meaningful training and jobs, transparent community-oriented policing and advancements in the social and environmental factors that surround these elements must be a priority. To carry out this work, new forms of leadership will be required for subsequent generations that build upon the legacy of political and social activism Cleveland is noted for. Artifacts of the past and plans for the future of Cleveland must act as a foundation for this work, along with exhibits that serve as a lasting tribute and illustration of a bright and purposeful future for the residents of Cleveland and neighboring communities who benefit from its position as a city of great promise and opportunity.